The founders of Darthula Baptist Church could be designated as John H. Hilton and Darthula Hilton. John H. Hilton was a grandson of the first pioneer Hilton in the area by the name of Samual Hilton. Samual Hilton was the first Baptist minister of the gospel to come to Scott County sometime between 1790 and 1795. 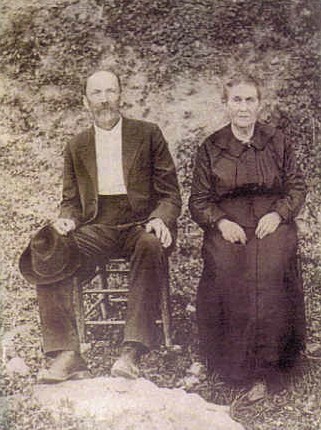 Darthula Hilton was the childless widow of John Wesley Hilton. Tradition says, "John H. gave the land; and Darthula donated the money. Darthula died before the project was ever undertaken. There was an elderly individual1 of the community, who knew both Darthula and John H., was quoted as saying; "the money never reached the hands of John H.", thus it seems that John H. may have donated both the land and the money.2. According to her will, Darthula was to be buried on the land John H. was to give for the church and school. The site included a Hilton family graveyard some one hundred yards east of what is know as Lunsfords Mill. Darthula's request was to raise her husband, John W. who had been buried on their farm3 about one mile east of the church site, and bury them together. J.W. and Darthula are buried side by side where the big river rock tomb is located on church grounds4. it is in the part of the cemetary located behind the church. On August 19, 1882 fifteen months after Darthula's burial, John H. Hilton executed a title bond, $500.00 was given to erect the structure to be used for a school building and a place to hold religious services of any religious denomonation of good standing. When the Darthula church and school building was completed, it appears that part of the members of the Sulpher Springs church, located at Brickyard Gap two miles west of Hiltons, moved to this place; therefore making it a branch of the Sulpher Springs church. The mother church, Sulpher Springs, must have been organized around 1840; however there seems to be no definate record of the date of its organization. The Darthula framed building operated as a church for 69 years, and as both a church and school for 34 years. It stood until the spring of 1951 when discussions and opinions arose as to the need of either reparing or rebuilding. Homer Larkey, a talented and experienced carpenter and cabinet maker, expressed his view which spoke for a new building. We need to say here that he initiated the rebuilding as well as doing much of the actual work. All materials of the old building were utilized, and completion was realized by July 13, 1952. Rev. Ted Duncan was pastor of the church at this time. Faye Larkey was the Treasurer, Jessie Addington was the clerk, and the former Lelia Hilton5 was the Sunday School Superintendent. This stuccoed building stood until it was destroyed by fire on February 1, 1965, between four o'clock and five o'clock in the morning. The cause of the fire has never been determined. Among the valuables which perished with the building was an old upright, player piano about fifty years of age, which was purchased and owned by the late James H. Hilton. The church had no pastor at this time, since Rev. Ted Duncan had already passed away, but Mr. Ezra Addington was Sunday School Superintendent. Now again, there was a definite need for a place of worship in the community. Mr. Ezra Addington was the most active member in the undertaking of the new building. He was consistent with work at the five days a week, then on Saturdays he solicited and collected offerings toward the construction. Now once more, Homer Larkey took the lead in planning the third structure, and did the greater part of the work; however, some jobs were done by Rev. Herbert Tuck, who is Superintendent of Missions in Clinch Valley and Wise Associations. Rev. Tuck's son Bobby, Rev. Paul Blessing and a group of summer missionaries under direction of the Student Department from Richmond, VA, also assisted in the reconstruction. This project, which branched out into Scott County, had also had help from several other community members that contributed greatly. The number is too numerous to mention here. The building was constructed during the summer of 1965. The first Sunday in October, 1966 was chosen as the day for dedicating the new building. Services were conducted by Rev. Row Harris, pastor of the church at that time, Rev. Herbert Tuck and also Rev. Paul Blessing. The church body was small in number; however they were a dedicated people, who were striving to please the Lord by serving in this sanctuary from Sunday to Sunday. The current pastor of Darthula Church is Layton Bentley. He became the pastor in 1979 filling the position of Rev. Roy Harris. Above research contributed by Ralph Derting. Here are some new pictures of Rev. William Hilton. He was the seventh pastor at Darthula Baptist Church. These pictures were sent us by Joe and Liz Ilnicki and Liz's mother Alma Hilton Marsells from Wisconsin. Alma's father, Almer Hilton, was the son of Charles and Elizabeth "Lizzie" Whited Hilton whom raised their children on the farm next to Lundsford Mill. Rev. 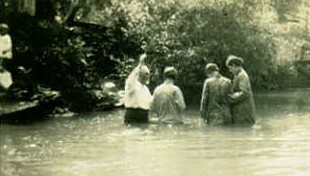 William Hilton (far right) and two other unknown local ministers. Rev. William Hilton's parents are at rest in the Darthula Baptist Church cemetery. William and Amanda pictured above also servered at Bethel Church near Nickelsville where they are at rest in the Church cemetery. If you would like to contact Liz about these images or other Hilton's related history, she can be contacted at believe4thebest@gmail.com. Since the original construction, Darthula Baptist Church has undergone many changes. The most recent was the addition of a Fellowship Hall to the building. With determination of Darthula Church's members, the Fellowship Hall was completed in a very short time. The construction was completed in the early Spring of 2004. - Lundsford Mill still stand today directly accross the street from Darthula Baptist Church, but it is no longer in working condition. - The farm now belongs to Layton and Brenda Bentley. - More pictures coming soon!! - Lelia Hilton was Mrs J.L. Neal at the time of the majority of this research. - Rev. Ted Duncan served as pastor during the time that the second building was standing from 1952-1965. - Rev. Roy Harris served as pastor for both Darthula Baptist Church and Hilton Baptist Church. More information and/or pictures will become available as research continues. Check back for updates! !